I love, love, love Pavlova and Meringues. I love them because they are light to eat, naturally gluten free and with a small bit of effort, relatively simple to make. I use it as a regular dessert for both family and guests as it can be an impressive way to finish a good meal. The pavlova recipe and the meringue recipe have very little difference. A pavlova is meant to have a soft mallow middle, whereas the meringue is supposedly crispier. This is achieved with a small tweak between sugars. For my pavlova, I use four egg whites. I’ll do a separate page for the meringue recipe. The pavlova recipe doesn’t have to be used to make one large one, and is rather nice when divided into mini individual pavlovas. I would make a large batch of mini pavlovas when there are a larger number of people at a gathering. I never refrigerate eggs and always have them at room temperature, this is personal choice. If you do refrigerate your eggs, get them to room temperature before embarking on these recipes! Baking Sheet, lined with parchment or greaseproof. 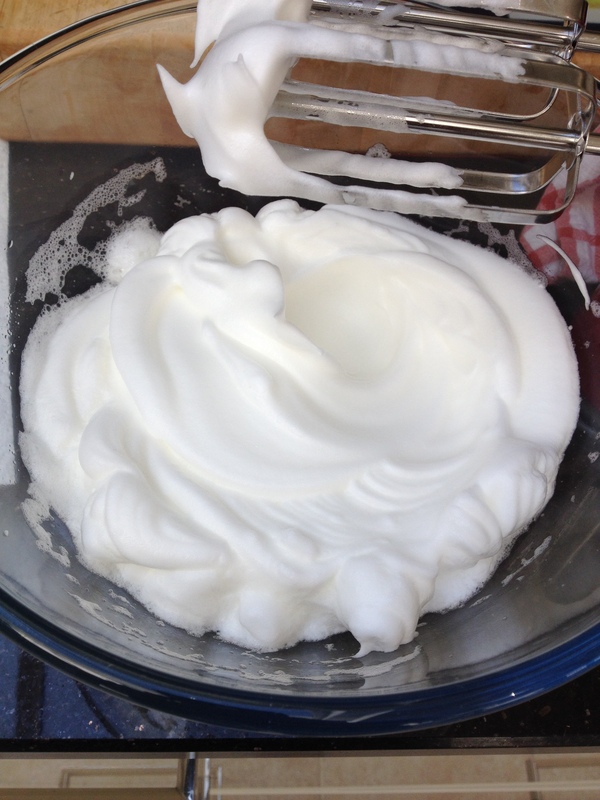 I always separate my egg whites into a different bowl before adding them to the mixing bowl. This way, if you accidentally get some yolk into your white, the whole mixture doesn’t have to be wasted. Once you have your egg whites in a large mixing bowl, use an electric whisk to beat them until they look dry and can hold a peak. When they have reached this stage, start whisking your sugar in, one tablespoon at a time. This gives the sugar a chance to dissolve. The mixture should start to turn glossy. 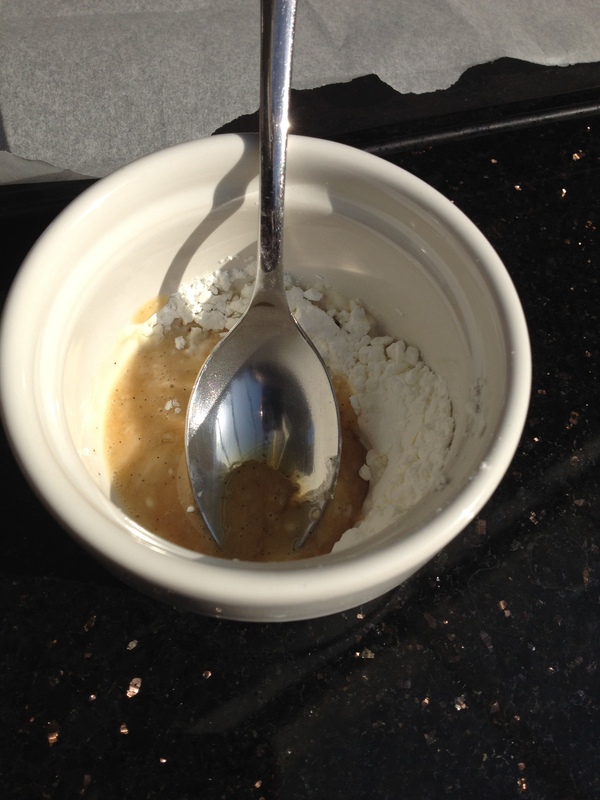 A few tablespoons before the end of your sugar, mix your gluten free cornflour, vinegar and vanilla extract into a paste. Add this mix to your egg whites and add the remaining sugar. This cornflour mix is your secret weapon in creating the soft marshmallow inside of the perfect pavlova! 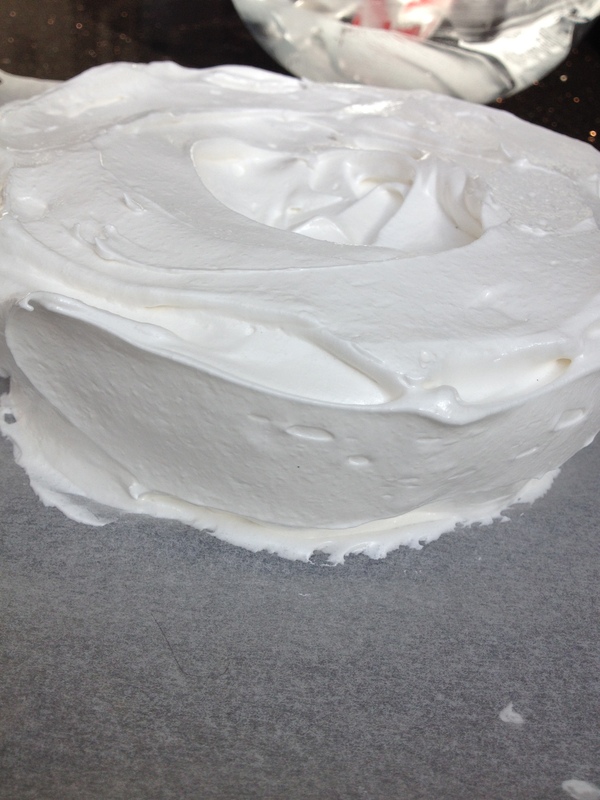 Spoon the egg white mix onto your prepared baking sheet and shape into your pavlova, working quickly and gently. Try to avoid air pockets when spooning onto the baking sheet. Leave a small dip in the middle where the cream will go once before serving. Or if you’re doing mini pavlovas, a tablespoon of egg mixture is enough for each one. Again, leave a small dip in the middle. Have the oven heated to 170 degrees and once your pavlova goes in, reduce the heat immediately to 130 for a fan oven or 150 regular. Bake for one hour after which, turn the oven off and leave the pavlova in the oven until completely cold. 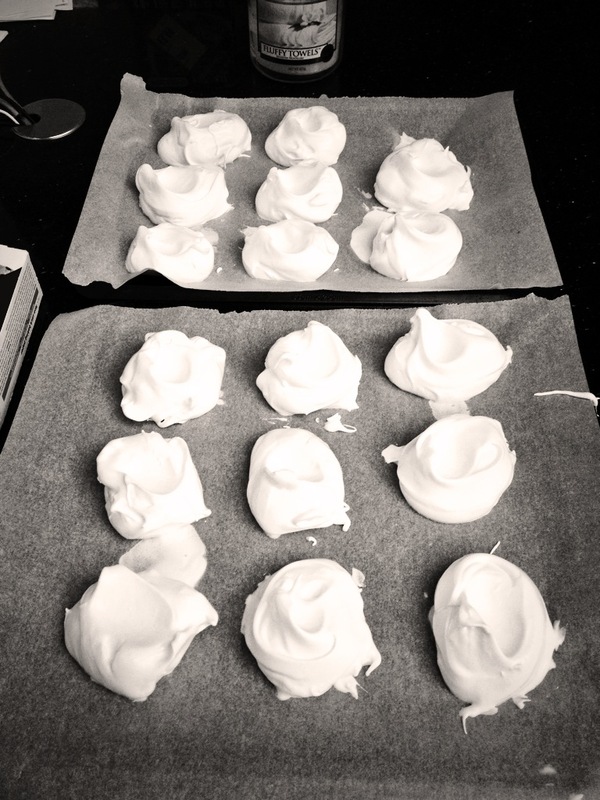 Top Tip – a small dab of the meringue mix under the parchment sheet on the baking tray, keeps it all in place. 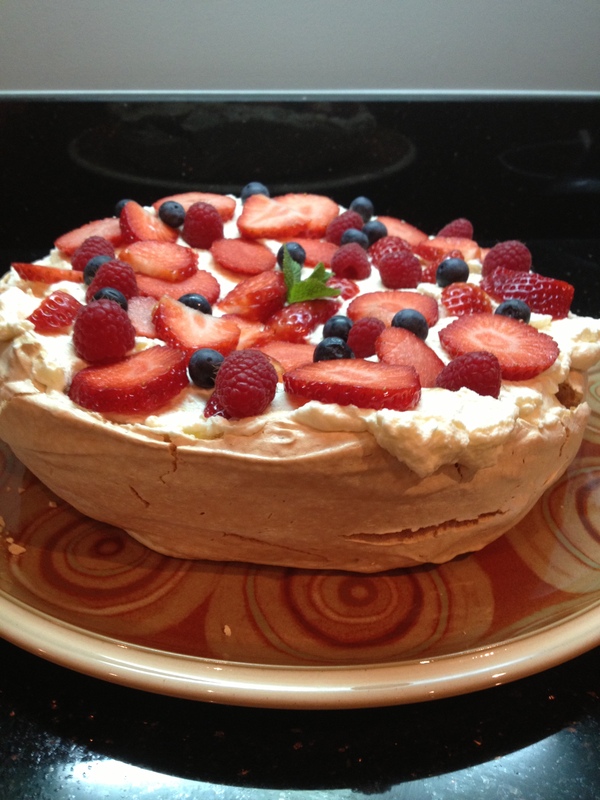 Gently remove your pavlova from the baking sheet and put straight onto your serving plate to decorate. I only decorate immediately prior to serving as the cream causes the pavlova to weep if left for too long. Enjoy, and as always, let me know how you get on.